The sensory overloaded consumer needs a little extra stimulation to grab their attention. Delivering your message through video and sound is so commonplace that consumers get almost no thrill from it anymore. It's a reaction to the ubiquity of video screens, including the ones in their pockets. Great video and an intriguing story line create a better experience, but imagine engaging consumers in action so real they can feel it in their bodies! iShake™ makes that happen! 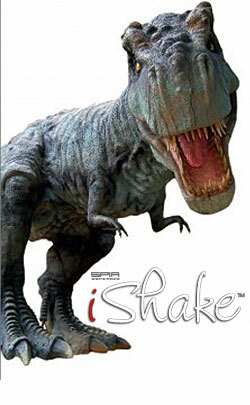 iShake™ provides engagement and realism in one irresistible package, by providing floor shake or rumble to accompany sound, video, motion graphics, and other media experiences. It adds depth and realism and helps people get deeply absorbed or "lost" in the content they're hearing, seeing, and feeling - heel to head. And there's nothing better than drawing-in consumers who's attention you're after. For example: imagine watching a dinosaur video with no audio - it's okay, but sound adds much more to the content. Add iShake™ and you've created an all-encompassing experience that makes plain old audio/video seem obsolete. iShake™ is a completely customizable solution, based upon the amount of floor space you want to cover, the level of power you want to deploy, and portability. It's a natural addition to trade-show exhibits that need to grab attendees attention and stand-out from the competition.